The Promotional Can Cooler is a great quality item at an fantastic price. Comes with a free second side imprint in one ink color. Item has a felt liner and cloth exterior available in ten different colors with over thirty choices of ink colors. It's collapsible, cheap, durable and keeps drinks cold. It's a favorite among our customers for a reason and to ensure the quality of this item we make it right here in the USA. These can coolers fit 12oz cans and most bottles and make a great giveaway to promote your business. 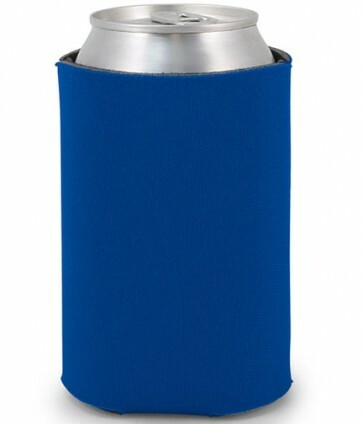 This koozie keeps your drink cold and your hand dry, when you're all done it folds into your pocket. The Promotional Can Cooler is a great custom koozie made with quality materials at an amazingly low price.